Each phase of the Open Beta (Early Access and All Access) will launch in all gameplay regions at the same time globally. To find out when the Open Beta will be launching in your region, please see the reference guides below. The early access portion of the Open Beta will begin on all supported platforms May 2 at 4:00 p.m. PDT (11:00 p.m. UTC). An early access key will be required to play—click here for details. The all access portion of the Open Beta will begin on all supported platforms May 4 at 4:00 p.m. PDT (11:00 p.m.UTC). All players will be able to play for FREE during this period; no sign-up or code required. Before you begin, you'll first need to download the Overwatch Open Beta on your chosen platform. To install and play on May 3 (for Early Access) or May 5 (for All Access), please follow the instructions below. Step 4: Select "Overwatch Open Beta" from the search results and then click "Download." Step 2: Go to the Xbox One Store, select "Games," then select "Search All Games." The Overwatch Open Beta client will be available for download on all supported platforms beginning at the designated launch times listed above: on May 3 (for Early Access) and on May 5 (for All Access). Pre-download will be available for players eligible for early access on Windows PC and Xbox One beginning April 29. Q. What game content will be available during the Open Beta? A. During the Open Beta, players will have access to Overwatch's full roster of heroes, maps, and launch-day features—includingCustom Games, Loot Boxes, and Weekly Brawl. We want players to get a feel for the complete Overwatch experience, so no content will be restricted or locked! A. There are 21 heroes available to play in Overwatch! To learn more about these heroes, click here. A. 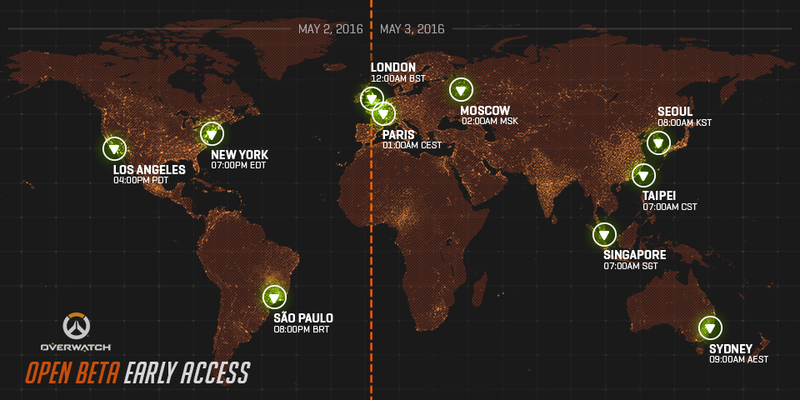 There are four different game modes and 12 different maps available in Overwatch! A. All game modes and maps currently support 12 players in a 6v6 format. Q. What different play modes are available in Overwatch? A. There are a variety of ways to play Overwatch! Q. What's the approximate download size of the Open Beta client? A. For PC, the approximate download size is 6.5GB. For PlayStation 4 and Xbox One, the approximate download size is 11GB. A. Due to the multiplayer nature of Overwatch, Xbox Live Gold is required to play during the Open Beta and at launch. PlayStation Plus is not required during the Open Beta, but will be required to play at launch. Q. What languages are supported in the Open Beta? Q. Will my progress from the Open Beta carry over to the launch version of the game? A. No. All progression including skins, rewards, levels, and stats gained during the Open Beta will be reset at launch. This includes any progression gained during the early access portion, as well. Q. Will PC and console gamers be able to play together during the Open Beta? A: No, cross-platform play will not be available during the Open Beta or at launch. Q. Will there be any sort of maintenance planned during the Open Beta? A. There's no downtime or maintenance currently planned for the Open Beta on any platform. If this plan changes at any point, we'll be sure to provide information about major service interruptions in the official beta forums. For additional status updates, be sure to follow @PlayOverwatch on Twitter. Q. What are the PC system requirements for the Open Beta? Q. Can I stream or create content about the game during the Open Beta? A. Absolutely! There is no non-disclosure agreement (NDA) for the Open Beta. You are encouraged to take screenshots, livestream your play sessions, record feedback videos—whatever your heart desires. Q. Can I run tournaments with a prize pool during the Open Beta? A. You are welcome to run tournaments (with or without prize pools). Prior to the game's launch, however, we will not be issuing tournament licenses for large-scale events with prize pools over $10k. For smaller events, please review our Community Tournament Guidelines before you begin planning to make sure your community tournament is in compliance. If you would like to begin discussing your tournament plans for after game launch, or have any other questions, feel free to reach out to tourneyinfo@blizzard.com any time. Q. What is the business model for Overwatch? A. Overwatch is currently available for pre-purchase on Windows PC, PlayStation 4, and Xbox One. For more information, visit www.buyoverwatch.com. Q. When will the game be released? A. Overwatch launches May 24, 2016!